Friederike Czada, or Maria Ley as she would become known to the public, was the daughter of a Hungarian architect and an Austrian concert pianist. She was educated as a solo dancer and internationally succesful in the twenties. Later she worked as a choreographer. Her first husband Robert Bauer disappeared without a trace in the twenties. Her second husband was AEG heir Frank Deutsch, who committed suicide in Paris after Hitler came to power. In 1937 she married for the third time. Her husband was director Erwin Piscator, with whom she left for the United States in 1939. Together they managed a drama school, the Dramatic Workshop at the New York School of Social Research. Marlon Brando was among the students of that school. After the Second World War Robert Bauer suddenly turned up. He had been involved in criminal business practices and had been a prisoner in Prague and Vienna and even survived concentration camp Auschwitz. He had been such a terrific bridge player that the camp commanders couldn't do without him. In 1951 Piscator had to leave for Germany because of his communist views. Madame Piscator, as she was known for the rest of her life, continued the school in New York. Every now and then she visited Berlin to see Piscator's new productions, but usually she returned quickly to the United States. After Piscator's death in 1966 she led the Piscator Foundation in New York. In 1989 Madame Piscator's autobiography was published, "Der Tanz im Spiegel" ("Mirror People"). When she was ninety years old she still taught at American universities. But she was cheated out of her wealth and when she was 95 she was declared mentally incompetent and put away in a nursing home by greedy relatives. Even so, she refused an offer to spend the rest of her life in Germany. When she was 100 she was bright enough to state that she had served Piscator's ideas because he had been smarter than she was. 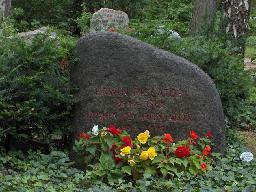 She lived until the age of 101 and after she died she was buried beside her husband in Berlin. 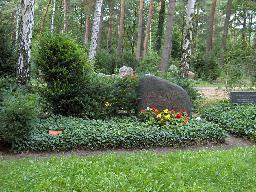 The grave of Erwin Piscator and Maria Ley at the Waldfriedhof Zehlendorf, Berlin.